Despite Cameron’s pledge to reduce net immigration to “the tens of thousands by 2015,” the latest figures released in November show a rise from 180,000 to 260,000. The number of immigrants from outside the EU being granted British citizenship is the highest since records began with the UK handing out nearly a quarter of all citizenships within the European Union, according to Eurostat. Net immigration to Germany stood even higher at 437,000 last year. On top of this, a growing crisis of illegal immigrants from outside Europe are massing at Channel ports, desperate to get to the UK for its perceived ‘soft touch’ approach. The Home Office now reveals that 3,000 illegals a month had been detected at British ports and Calais in the first four months of the year - and this doesn’t include all those undetected. Displaying a mixture of complacency and incompetence the UK Government under Labour, first lost control of the immigration and asylum system and then tried to spin the idea that large-scale immigration was vital to our economic interests. Growing evidence has shown this to be profoundly misleading. 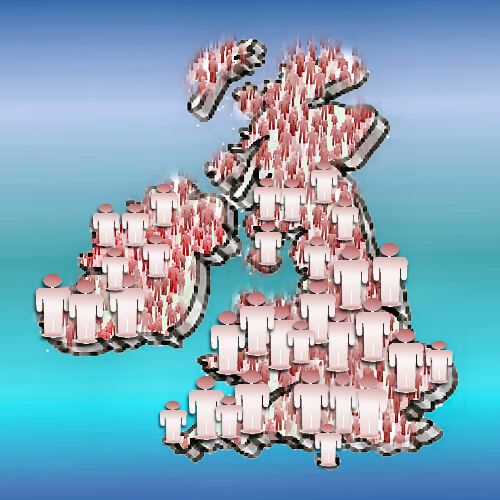 A Eurosceptic press and most politicians focus on Europe, but despite recent rises in immigration from the EU, fuelled by high unemployment in some countries, the majority of immigration into the UK is still from outside Europe, now at 272,000 as against 228,000 EU citizens. The debate ignores this, just as we have failed to get to grips with the still easy ‘entitlement’ access to benefits for people coming to the UK. The Prime Minister claimed in May this year that there was little we could do to change the rules on EU migrants claiming UK benefits for children not even living in the country, yet only four other EU countries operate a similar system on welfare. In the same way the number of foreign criminals allowed to remain in Britain under ‘Human Rights’ has gone up by 50 per cent, despite Cameron’s claim that he would crack down on this abuse. Now he claims to have woken up. But there is much Europe urgently needs to look at. In 1950, the countries that later constituted the EU-27 had a population of 370 million. By 2010 it topped 500 million - equivalent to absorbing the inhabitants of another present-day France and Britain combined. Of the 1.4 million growth from the previous year, 900,000 resulted from legal immigration into the EU, according to Eurostat, with 880,000 immigrants granted legal settlement in 2012. It is not just the rate of legal immigration into the EU that is worrying. Instability in North African countries and many failing states has seen a big jump in illegals trying to enter Europe as thousands more arrive in Italy. In 2010, one in six of the Libyan population were estimated to be sub-Saharan illegals. After Gadhafi’s overthrow the numbers crossing the Mediterranean grew rapidly in the chaos that followed. Many more land in Greece, already trying to cope with crippling austerity measures, and Spain, while generous policies in Sweden are enabling thousands of migrants to settle legally there and under freedom of movement, settle in other member countries. National authorities in the EU are apprehending around 500,000 illegal migrants annually, according to the EU Home Affairs Directorate. This presents a huge challenge. Yet lobby groups like the Refugee Council demand that we accommodate these continual pressures from failing states with exploding populations, merely, negotiating how many each EU country should take. Do the media and politicians seriously think that Europe can take in the populations of sub-Saharan Africa and beyond? When will the line be drawn? Most developed countries are already unsustainable in terms of resource use and the environment. A global people-trafficking industry is running rings around the EU’s ‘human rights’ approach. The EU needs to send a clear message that illegals landing in Europe will quickly be sent back to their country of origin, not be accommodated and then allowed to move around Europe. Part of the problem is that EU countries don’t have repatriation agreements with many countries involved, but this could be remedied quite simply, as just about all the sender countries in Africa and many in Asia are recipients of generous Western aid. We need to use this leverage. Today, only Syria currently has an acute refugee crisis, but even here there is no need to give often large families permanent access to host countries. Many of those who claimed asylum from countries like Somalia now go back to their country of origin for extended holidays, but the claims for asylum continue. The Government talks about skilled immigrants Britain needs, but skilled immigrants account for only 20% of total non-EU immigrants in Britain and many actually do unskilled work when they get here. Proposals to cap numbers will barely touch the scale of the true problem — a permanent population swelling so quickly by other immigration pathways, including a generous interpretation of family reunion and chain migration from outside the EU, that is adding to the pressures on our environment, welfare, food and energy security. Do politicians, including the Green Party, not think of these vital issues? In this well-connected world of cheap telecommunications and travel it should not be a country’s obligation to take in extended families and relatives, beyond immediate child dependents. The current level of immigration and increasing birth rates will require building the equivalent of a new Birmingham, our second largest city, every two years. How can we possibly accommodate this madness and claim it is sustainable growth? This is a legitimate concern for millions of people, whatever their colour and background. In 1998, when Labour came to power, the Office for National Statistics predicted that the population would rise to 65m in 2051 and then slowly decline. Just 10 years later, they re-projected that the UK population would rise to 77m by then and 85m by 2083, mostly as a result of immigration. Calls for ‘balanced’ migration, between numbers in and out, by MPs Frank Field and Nicholas Soames are ignored. The growing consequences of these pressures will have profound impacts. If the coalition is ever to meet its aim to reduce net migration to just “tens of thousands a year” – a figure still unsustainably high in our densely populated country, it must first stop giving an easy right to citizenship to people who come here to work or study. Most foreign students outside the EU come here to study, but this should not be promoted as a gateway to permanent British residency. The system has been notoriously abused, particularly in bogus English language schools, from which students just disappeared into the illegal economy. The Government’s announcement in the summer that 750 bogus colleges have so far been closed down illustrates the depth of the problem it allowed to proliferate. Now the National Audit Office has found that bogus foreign students at new private higher education colleges are being subsidised by taxpayers for student loans, with little intention of study. Nor is the supposed insistence on speaking English enough to discourage arranged marriages from the Indian subcontinent. Government needs to get bolder and bring back the primary purpose rule, dropped by Labour, under which men and women were not allowed to come into this country primarily for the purpose of an arranged marriage and getting UK nationality. People trafficking and sham marriages continue without enough focus from the Home Office to stop it. David Cameron now promises a further review of welfare benefits for migrants from the EU, but equally, we need to look at the continuing pull factor for illegals. The EU Commission claims it doesn't have details of social welfare payments for illegal migrants, as it is the exclusive responsibility of Member States to set the amount and the rules for these payments. Asylum seekers are also the responsibility of individual states, subject to Article 13(2) of Directive 2003/9/EC, to ensure a standard of living adequate for the health of applicants. A study by the European Migration Network in 2014, Migrant access to social security and healthcare policies and practice, found that non-contributory old-age pensions are available to third-country nationals with fixed-term residence in six Member States and access to non-contributory family benefits in ten Member States. In September it was reported that illegals were being given 35 euros a day by the Italian Government and it was paying 30 euros a day to accommodate each illegal, asking Italian citizens if they could house illegals in their homes. All generous incentives considering the average income of many people from source countries involved. We need a bigger picture of the interconnected drivers and urgent action at both European Parliament and national level to address collective immigration policies and welfare incentives to immigration across the EU. The growing cost to communities of accommodating large-scale inflows of people, in a now crowded world, raises many challenging questions. This is not a left or right issue or racist. It is about social and environmental sustainability. Nick Clegg claims the Lib-Dems are the party of environmental values, but all the major parties’ blindness to the impact of current immigration into the UK and Europe is deeply worrying for our future in an increasingly resource-scarce world. The demographic issues facing Europe are in my opinion the greatest problem that Europe has faced since WWII, yet the inability of people to see that there is a problem is why reactionaries are the ones dealing with these issues, albeit in a ham fisted way. The issue of Putin is nothing compared to the unprecedented demographic changes occurring. From what Putin has said, I think he realises this too which places him first and foremost to lead Europe. That people can acknowledge that the UK will be minority British, but not understand the significance of this or consider it something of an issue is frightening because it means that the solution to this problem will be forced by other means. This is the niche that the far right parties are filling, and they will eventually win because the problems forcing them into power are simply to significant to be swept away with platitudes. The question is whether the likes of Cameron or Hollande will realise this, or continue to hold outdated 20th century ideology and resist change.